"For me, the process is the product. My work is a reflection and response of my love of the natural world. I want my work to reflect an energy and directness. 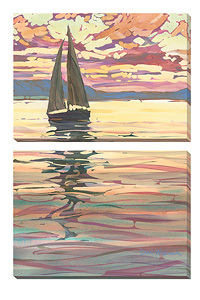 As a landscape artist, I paint both on location (plein air) and in the studio. Working primarily in watermedia, I utilize the opaque nature of acrylic and the transparent qualities of watercolor to create contrasts. I play with the shapes and textures of the landscape. 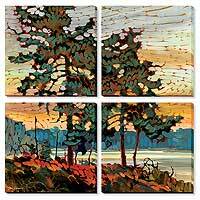 I'm especially inspired by edges - not only edgesof shapes, but edges of places - where the water meets the rocks, where the Canadian Shield rock meets the pines, where the woods meet the prairie. I try to find rhythms in the scene that translate into exciting motifs. I don't try toreplicate nature, I try to distill, stylize and give the viewer my interpretation, something they can be a part of." Trained as a graphic designer (B.A. Iowa State University), Dan Wiemer's career evolved from a commercial art director/graphic designer to freelance illustratorin 1988 and now as a full time fine artist. 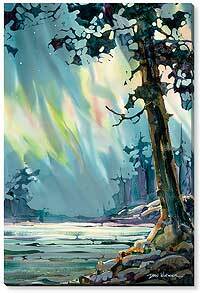 As a past president of the MinnesotaWatercolor Society, he saw the endless variety of ways to handle watermedia. 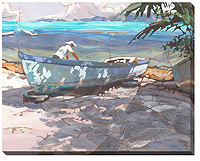 Dancontinues to share his talents with other artists as a workshop instructor.